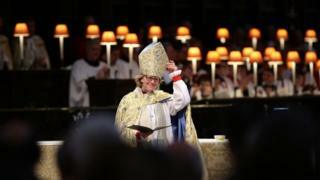 Former chief nursing officer the Right Reverend Dame Sarah Mullally has been installed as the first female Bishop of London at a service held at St Paul's Cathedral. The 56-year-old was appointed to the role in December and becomes the 133rd Bishop of London. Legislation to allow female bishops was formally adopted by the Church of England in 2014. She takes over from Dr Richard Chartres who retired in February 2017. Bishop Mullally now holds the third most senior position in the Church of England, having previously been the Bishop of Crediton in Devon and the Canon Treasurer at Salisbury Cathedral. She was made a Dame Commander of the British Empire in 2005 in recognition of her outstanding contribution to nursing and midwifery. Bishop Mullally performed the tradition of knocking three times on the Cathedral's Great West door with her pastoral staff during the service. In her sermon, she preached on the theme of "being subversive for Christ" - noting that 150 years ago this week, suffragettes placed a bomb underneath the same seat upon which she had been enthroned as Bishop of London. She also spoke of the challenges facing London, particularly escalating knife crime, and referenced historical sexual abuse within the Church. Bishop Mullally called for a culture that "challenges deference and the abuse of power" and for victims of abuse to be listened to. She added: "We need to speak up for the whole of London, to work to challenge the violence and the crime that have led mothers to clean their own children's blood from our pavements. "Could there be a starker image or a more urgent wake-up call for all who love this city, who believe it can have an even better future?"